Ernesto Yerena's poster produced in collaboration with the Amplifier Foundation. Photographs and video from the Families Belong Together march held in downtown Eureka on July 30 stand out for the snappy graphics of the homemade signs marchers carried from "Zero Tolerance for Human Rights Abuse" to "Stop the Racism! 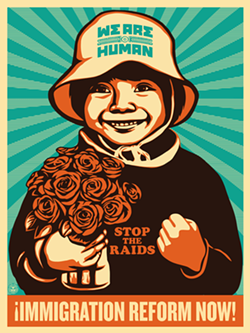 Stop the Deportations!" and "Who's the Illegal Alien, Pilgrim?" As thousands of protesters marched and made the news, blogosphere think pieces heralded the rebirth of the handmade protest sign. This proudly low-tech vehicle for personal expression is experiencing something of an Instagram renaissance as protesters compete to craft brief, witty slogans, posting pictures of especially cute, funny, scathing or memorable signs in the hopes one will go viral. And even as this storm of DIY creativity has been unleashed, protest events have become venues where certain artists are able to propagate meme-ready designs. 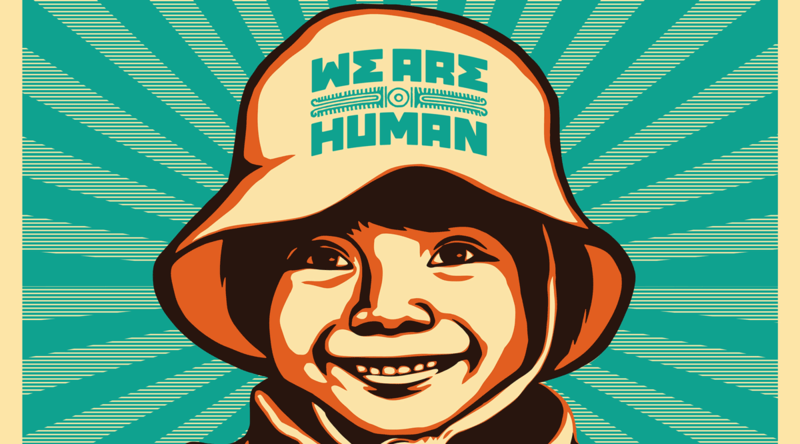 One poster that appeared at the Eureka march showed a tiny, beaming child wearing a sun hat and carrying a bouquet, emanating rays that illustrated an essential innocence and grace. The legend reads: "We are human. 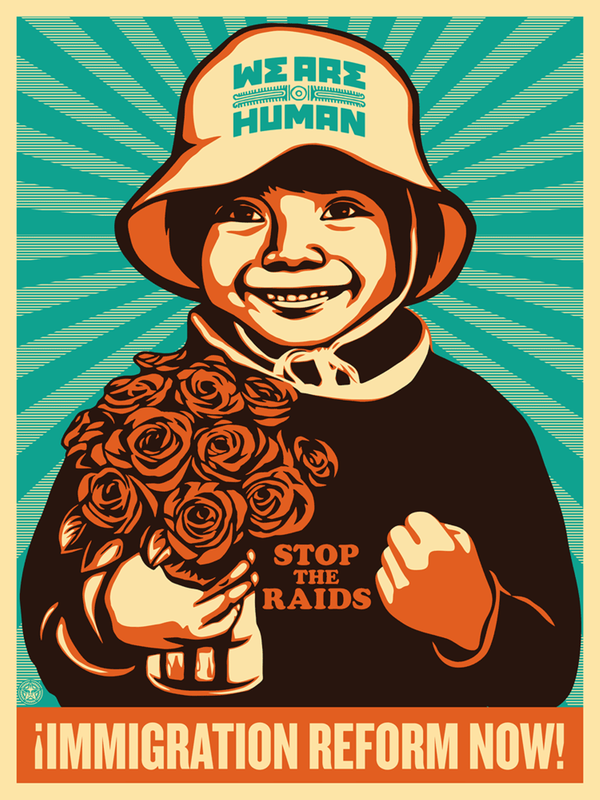 Stop the raids. Immigration Reform Now." The image looked familiar. I recognized it as one by Los Angeles artist Ernesto Yerena. A red, white and blue placard bearing the striking likeness of a woman wearing a hijab patterned with the stars and stripes, captioned "We the People," also induced a double take. Was that one of the Harmony and Discord series of color lithographs famous street artist Shepard Fairey had made at New York City's Pace Prints several years ago? I asked around to discover how recent graphic works by nationally prominent artists were taking to Eureka streets. It turned out this had a lot to do with Arcata printer Bug Press, which had posted images of graphics by Yerena and Fairey on social media that morning with the cheery caption: "We are printing a limited number of these posters for free at the end of today. Come and pick them up!" 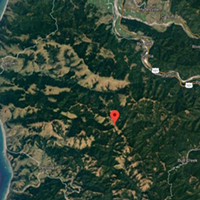 Press owner Robert Arena, who has been printing in Arcata since 1972, sees this work as an extension of the nonprofit endeavors he and his associates have carried out for years alongside the press' commercial work. Past projects have included online archives and photo exhibitions. The most recent is a curated collection of historic shots from the 1930s by the likes of Dorothea Lange and Walker Evans, accompanied by quotes that compare inequality during the United States' Great Depression with rising levels of inequality in American society today. "We put it out at the beginning of December, the time of year when disadvantaged people are hardest hit," the low-key Arena observed mildly, allowing, "It was a critical comment." The press' long-running program of free poster art reflects another approach to public service. Some months, Arena prints works by local artists. In other months, he and his staff reproduce historic works of poster art. May and June of this year featured prints by Maureen McGarry, whose plein-air watercolor landscapes evoke the terroir of rural Ireland. For July and August, the press is featuring 20th-century railroad posters harkening back to the golden age of British Railways design. "If you're making it in some way, you've got to give back," Arena said. "It's important to make people aware of the beautiful parts as well as the bad parts of the place where they live." Taking part in a public art project called We the People, started by the Seattle-based Amplifier Foundation, was another way to foster public dialogue. Amplifier, a nonprofit arts organization founded by National Geographic photographer Aaron Huey, describes itself as "a design lab dedicated to reimagining and amplifying the voices of social change movements through art and community engagement." Lissie Rydz of Bug Press said that the decision to collaborate with Amplifier "came from our realization that at this political moment, there was a demand in the community for images that would convey a sense of solidarity against injustice and hate." The press made its first such images last year in direct response to public demand when clients came to the press requesting posters for the Eureka Women's March. "An older lady came in and asked us to make her a sign; she brought in a cover of Time magazine with a Trump caricature, and said she wanted it printed so she could carry it in the march. She knew exactly what she wanted," Rydz remembered. Workers at the press "decided to print a few extra" that day, since demand was evident. "Wanting to produce images that respond to the needs of the community and coming up with various different ways of doing this, can be a challenge," Arena observed. "At the same time, it's important to not become identified with a particular partisan group or faction: We're a business, not a political action group." He pauses, lost for a moment in contemplation. "It's rewarding work. But it's also a delicate balance." Bug Press makes prints of artwork by selected local artists freely available on an ongoing basis. The Press will be displaying historic British Railway travel posters in their front gallery windows and giving away prints through August. Posters designed by Ernesto Yerena and Shepard Fairey in collaboration with the Amplifier Foundation are also available for free while supplies last. Visit Bug Press at 1461 M St. in Arcata or see www.bugpress.com for details.